The hunt is officially on for the long lost footage from Halloween 5: The Revenge of Michael Myers. Many casual horror fans probably haven't even seen this particular entry and, even amongst the franchise's most die-hard appreciators, it's not often listed as a beloved entry. Still, there has always been a fascination with the famed footage that was cut from the movie prior to its release. Now, 30 years later, with some luck, that footage will be revealed to the world. This information comes directly from Compass International Pictures and Trancas International Films who, through the official Halloween Movies Twitter account, revealed that they're searching for the infamous footage. The tweet was shared with an image of the screenplay, and two more images showing boxes upon boxes of archived footage that is being sorted through as we speak. The photos were shared with the following caption. "What're we up to? 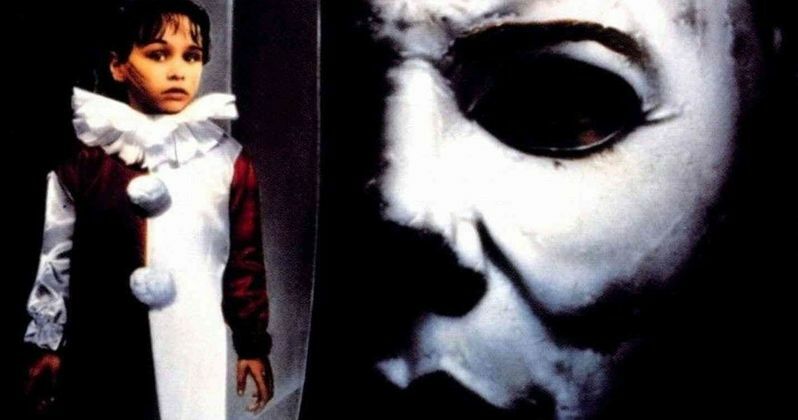 In search of that 'lost' footage from #Halloween 5... #MichaelMyers"
Halloween 5: The Revenge of Michael Myers takes place a year after the previous entry. Michael Myers has been in a coma for a year and, upon reawakening, makes his way back to his home in Haddonfield, Illinois. The masked killer is hellbent on killing his niece, Jamie who has been institutionalized since their last encounter. Things get particularly bizarre when franchise staple Dr. Sam Loomis suspects that Michael and Jamie actually share a psychic connection of sorts. In typical fashion, Loomis joins forces with the authorities to try and stop Michael. Again. As for the lost footage itself? The most desired bit that was cut from director Dominique Othenin-Girard's movie ahead of its release in 1989 is an alternate opening sequence featuring someone known as Dr. Death and manages to resurrect Michael Myers using a spell. Yes, things got pretty weird in the later sequels. Michael brutally kills Dr. Death upon returning to the land of the living. Other alleged items of note include Michael killing an entire S.W.A.T. team, Jamie getting stabbed and the reveal of Michael's burnt face. And this is just what we know of. If this expedition proves to be fruitful, who knows what may turn up. The movie, as it exists, was a critical failure and didn't do much at the box office. One would expect that, if this footage is found, the idea would be to release a director's cut, or something of the like of Halloween 5. This would be an interesting, if somewhat pointless (in terms of storytelling) exercise. The recent Halloween sequel from Blumhouse completely wiped away the canon of the franchise, save for John Carpenter's original movie. So this movie is no longer part of the overarching story. Still, for horror fans out there, seeing this footage, especially spliced into the movie, would be fascinating. Feel free to check out the original post from the Halloween Movies Twitter account below.